Happy Chanukah and happy holidays to you all as well! How did mommy get you three to sit so nicely - or is that photoshop magic? Happy Chanukah! Happy Chanukah to yous and your family! 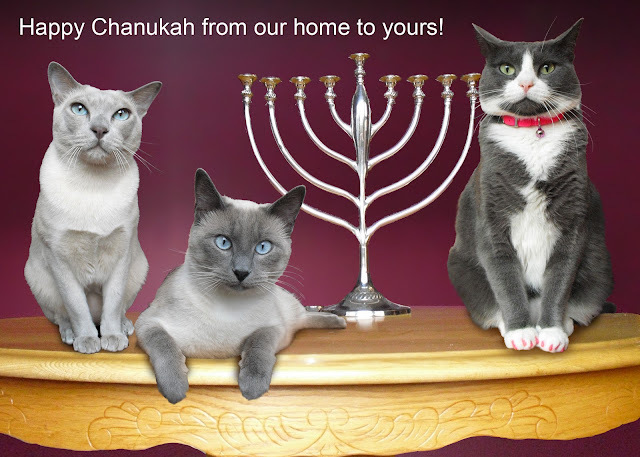 Happy Chanukah from the 3 kittehs, WooHoo and fanx. Happy Holidays to all furpals and their hooman family too! Happy Chanukah you guys. And EK says to send special Chanukah kisses to Allie. Sorry Allie.